It’s been long since….8th grade, I think? A long time, let’s leave it at that. I never used to know what the heck to do with all my hair, so it was habitually put into a messy bun at the back of my head. I’ve gotten better with finding different ways to style it, but I love the styles from the ’40s and ’50s. The problem is that hair was usually worn (much) shorter then. I can pin curl and victory roll ’til I drop, but it never looks quite right, as it’s about 8 inches longer than it should be for those styles. I could just cut my hair, but that is something We Shall Not Speak Of. Lately I’ve been looking back to eras when women wore their hair long, which landed me in the Victorian era. And can I just say, oy gevalt. Holy moly. Shut the front door. Sweet fancy Moses. Apparently, this was the time period when going to a hairdresser became popular, and it shows. Some of those styles look like they require 6 people, 2 hours, a Nembutal, and a yak to put it all together. 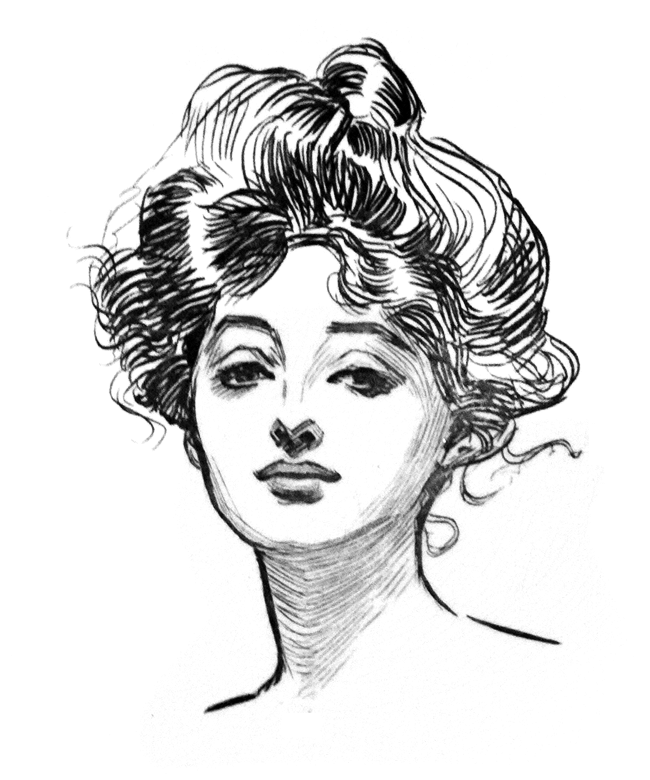 Eventually I remembered the Gibson Girl. The Gibson Girl, who wore her hair piled on top of her head. Now that I can handle. Here’s the result of one of my attempts. The good news is that this style is supposed to be messy, so I’ve got that going for me. Which is nice. Want to have Gibson Girl hair? Read on! You will need a hair brush and bobby pins. That be all. Your hair also needs to be long enough that it can all reach the top of your head. If it can’t all be piled up on top of your head, it’s too short for this style. First, brush your hair. Next, part your hair from one ear across to the other ear. Brush this section smooth. Now, you can insert a hair fall under this section, or you can tease it to get height. If you look back at photos of this style, some of those ladies could have taught hair bands a thing or two about big hair. Anyway, I don’t like teasing my hair, so this is what I do: Twist the hair. Lay the twist against your head. Push it forward to give your hair some height. All you’re doing is creating a sort of faux pomp. Pin the twist in place. Now. This next step can go one of two ways – it can be easy, or can get elaborate. I’m going to show you the easiest way to get the Gibson Girl look. So. The easiest way to do this (for me, anyway) is to flip your head upside down and brush the hair smooth. While your head is still upside down, gather all your hair into your hand. Stand up straight and twist the hair. Start coiling the hair loosely. You want to coil the hair right on top of the bobby pins that are already there. The bobby pins used to pin the front section of hair in place will act as an anchor. Again, coil loosely. You’re trying to achieve a loose sort of mass, not a rigid bun. Pin the coil into place. Crossing your pins over each other in an X shape around the perimeter of the coil is the easiest way to go. And that’s that! Done. If it’s loose and full of fly-aways, that’s okay. It’s not supposed to be perfect. My hair doesn’t have nearly the height that some of the ladies achieved back in the day. That’s fine by me, as this is just an easy daytime style that’s comfortable to wear, and can be done in less than 10 minutes. Pinky swear. Later, I’ll post a tutorial on how to do fancy Gibson Girl hair with twists and swirls and all sorts of fun stuff. I've been looking at your overnight curling methods and having a lot of fun — thank you! I've got long straight hair and am trying to find things to do that don't involve blowdrying, so your site has been very helpful. My hair gets the texture of a cactus if I blowdry it, so I know the feeling! Thanks. I enjoyed your site. It was easier to follow. I love the Gibson girl era!I have photos of my great grandmum and aunt with this lovely do',I am so happy you have listed the directions to fashion it the correct way; I would simply twist my hair and clip it to my head.It looks really nice on you!! Thank you! I've gotten better at it with practice, but sometimes it's hard to get all that lovely height on top. Big hair for the win!